Exploring British Columbia by car is a fantastic way to get about in Canada. There is so much wilderness that you would be hard pushed to experience it without your own wheels. Seven national parks and ten mountain ranges mean that British Columbia has a wealth of outdoor activities and incredible scenic drives just waiting to be discovered. This is a holiday with a difference; the hard part is deciding which mountain, lake or city to visit first. This beautiful city has a lot to offer, shopaholics will love Gastown, the city’s oldest neighbourhood, full of independent boutiques and lovely wine bars. Visit the observation deck at the Vancouver Lookout to enjoy panoramic views of Vancouver and its surroundings. 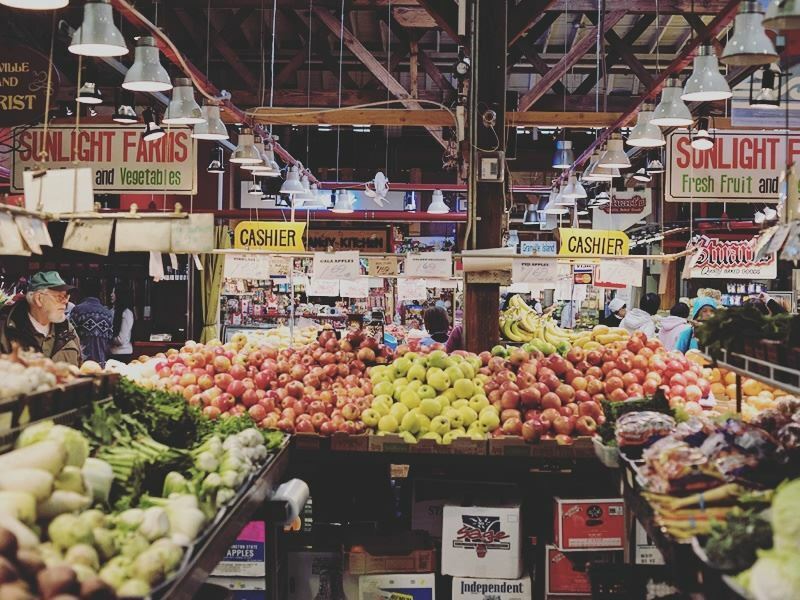 There are an abundance of farmers markets in the city so be sure to purchase some fresh local produce. Fruit, vegetables, eggs, artisan bread and even micro breweries, you name it and you’ll find it at one of these local events. The Downtown Farmers Market at Queen Elizabeth Theatre Plaza and Granville Island Farmers Market; the oldest in Vancouver are just two of many. Afternoon tea is a popular past time here and a nice holiday treat, Urban Tea Merchant, serves up traditional afternoon teas and ones with a twist. The Brunch Tea Set is perfect for mid morning munchies, tea infused cocktails are a delightful add on. For a very traditional high tea the castle setting of the downtown Fairmont Hotel is a must, add a glass of champagne to make it really special. Vancouver has stunning beaches; some are even walking distance from downtown. Stroll through the lovely Stanley Park along the sea wall to English Bay Beach, or second and third beach. Being a coastal city there are plenty of opportunities for adventures on the water, for kayaking paddle out from False Creek to see the city from a different perspective. From English Bay head to Stanley Park or go on a guided kayaking tour to learn about the history of this urban green space. Vancouver’s North Shore is an incredible place to explore by kayak, starting at Deep Cove paddle into Indian Arm an incredible fjord. Look out for majestic waterfalls and bald eagles high above. Canada has some interesting wildlife; bears can be spotted nearby Vancouver. There are resident black bears in the mountains surrounding the city so if you go hiking you may be lucky enough to spot one. For grizzly bear sightings visit Grouse Mountain Wildlife Refuge where two grizzly bears orphaned as cubs now reside. 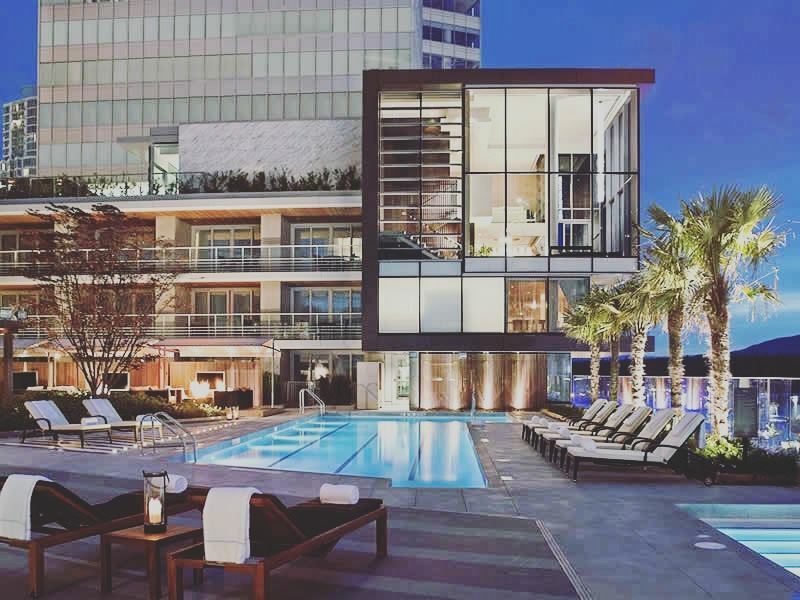 For your city abode Fairmont Pacific Rim is a chic downtown hotel with views of the harbour and mountains along with a rooftop pool and spa for relaxing after a day of exploring. The Loden Hotel is a boutique residence that will suit those looking for a quiet retreat in a great location. Start the day off with a coffee and breakfast at the hotel bistro; make use of the complimentary bikes to explore the city. Georgian Court Hotel is located downtown within walking distance of Vancouver’s main attractions. Rest weary feet after a day of adventures in the steam room or whirlpool and grab a bite to eat at Frankies Italian Kitchen and Bar. Catch a ferry from nearby Horseshoe Bay to Gibsons; escape the crowds here on The Sunshine Coast with its laid-back vibe, small waterfront towns and rocky inlets. 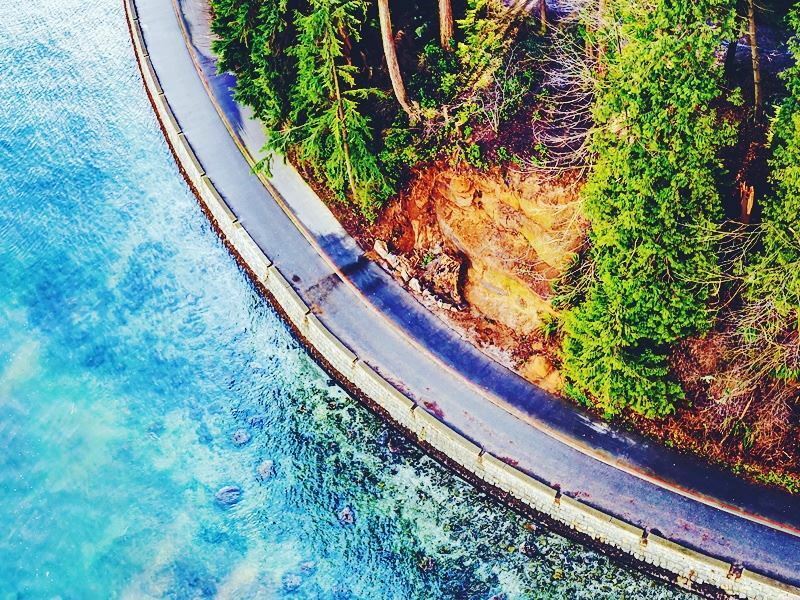 Leaving the city further behind take the Sea-to-Sky Highway (Highway 99) to Squamish, this stunning scenic drive reveals mountain and ocean views like no other. An outdoor enthusiasts paradise Squamish has a lot on offer from rock climbing on Stawamus Chief Mountain to bike riding along one of the many trails. For magnificent views of the Howe Sound and surrounding mountains take the Sea to Sky Gondola, from here go hiking or simply take in the panoramic views. The Squamish Spit is a unique location for kite surfing and other watersports and the national parks are ideal for a spot of river rafting. The glorious mountains of British Columbia are a must visit, Whistler has a whole host of summer activities from hiking in the fresh air to zip lining and swimming in a sparkling mountain lake. 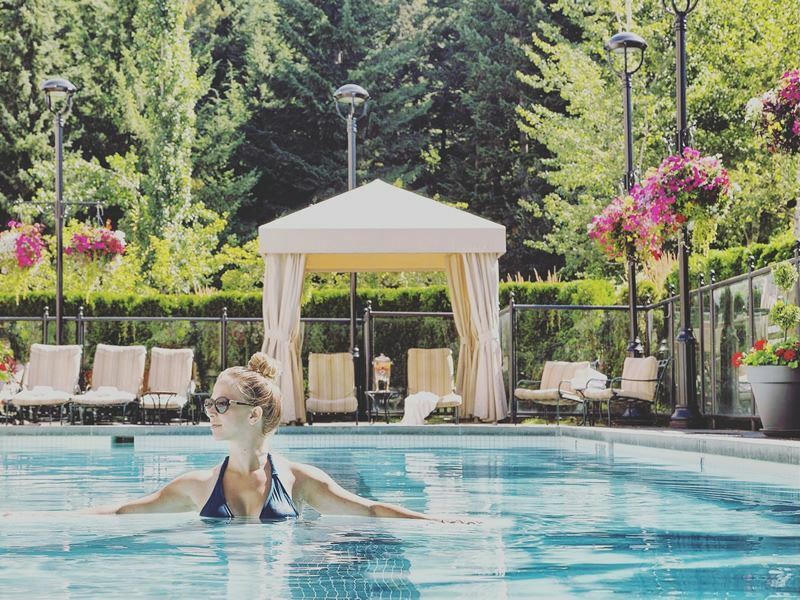 The Fairmont Chateau Whistler hotel is the ideal place to stay, relax at the outdoor pool and watch the sunset over the mountains at the fireside terrace. Victoria, the capital of British Columbia is found on Vancouver Island and is a great base to explore from. Delta Victoria Ocean Pointe located on Inner Harbour is close by to all of Victoria’s main attractions. Rooms with waterfront views, a spa, indoor pool and fitness centre make this the place to stay. While in Victoria hire a bike to explore the city, visit the Royal BC Museum and stop off for refreshments at a quirky coffee shop, go shopping or listen to the waves crashing in while relaxing at Beacon Hill Park. For a unique experience join a craft brewery tour, jump on the brew bus for a tour of three breweries and beer sampling. With rainforest, coast and mountains it would be a sin to just see Victoria so hop into your car and head to Pacific Rim National Park. Lush rainforest and a stunning coastline make this national park an outdoor lovers paradise, surf at Long Beach, whale watch, hike through rainforest past waterfalls on the West Coast Trail and scuba dive amongst the Broken Group Islands. For a glamping experience in the wilderness, Clayoquot Wilderness Resort is the answer, canvas tents with a luxurious interior make this glamping at its finest. Another exciting option is Sonora Resort, the ultimate luxurious escape. Hidden away on its own island surrounded by nothing but mountains, forest and water with the added benefit of a spa to rest and rejuvenate after a day of adventuring. Don’t miss exploring this gorgeous area it has such a diverse landscape from desert to waterfalls and mountains to lakes there is a lot to discover. Drive along the six-mile Hardy Mountain Loop, this short but scenic road is a nice mountain drive, perfect for photo opportunities. Get out and explore on a hike, The Kettle Valley Railway Trail is a hike like no other. Walk along the disused line and across the Myra Canyon, the impressive trestle bridges are high above the canyon and the views are breathtaking. Bertram Creek Regional Park is an easy hike along Okanagan Lake with plenty of stops for swimming along the way. For a more strenuous walk head to Big White Mountain. Drive to Big White Ski Resort and walk up to the peak at over 2,000 metres. It is a beautiful place in the summer with alpine flowers decorating the mountainous terrain and views of lush green valleys. The Sandman Hotel in Kelowna is ideally located to all these fabulous hikes and has all the amenities and facilities to make your stay an enjoyable one. This includes a pool, restaurant, sauna and hot tub, plus free parking. Thompson Okanagan is a wine quaffing paradise, vineyards dotted across the valleys open their doors for wine tasting and lunching with glorious views and plenty of sunshine. Go on a self-guided wine tour, hire bikes and cycle or choose a guided tour. Kamloops Wine Trail consists of three wineries and six vineyards, tour the vineyards, get tipsy in tasting rooms and relax on a sunny terrace with more wine over lunch. Nearby, The Thompson Hotel has comfy rooms, an indoor pool, fitness centre and The Noble Pig Brewhouse a great option for resting weary heads. 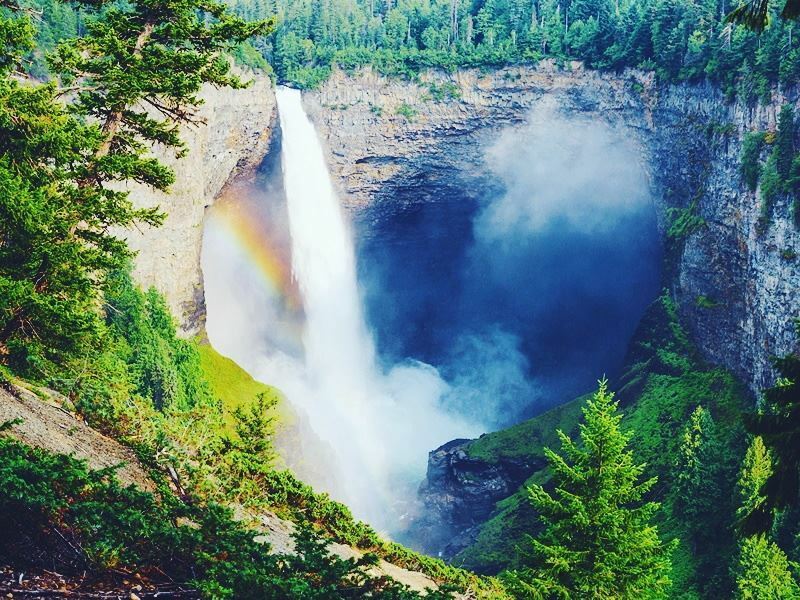 Wells Gray Provincial Park, an hour and a half from Kamloops has more than 39 waterfalls often called ‘Canada’s Waterfalls Park’ it’s easy to see why! Helmcken Falls is a must visit, higher than Niagara Falls this towering beauty is breathtaking. Head to the viewpoint just off of the road for fantastic photo opportunities, hike the one-hour Rim Trail for even more incredible views. At Moul Falls grab the opportunity to get behind the fast flowing water, the one-hour walk ends at the stunning cascading falls. Peer over from the viewpoint above or get a unique view by standing behind it. Twice the size of the UK, Northern BC is huge, so exploring by car definitely has advantages. This is wilderness at its finest, glacial lakes, hot springs, mountains, forests and a canyon, there’s a lot to see. Start with Great Bear Rainforest, BC is the only place to spot the kermode (spirit) bear. Famous for its white fur, you could be lucky enough to spot one on a wildlife-viewing safari here. Stay a night or two on a floating lodge to see grizzly and black bears. Great Bear Lodge is only accessible by seaplane; a stay includes two bear viewing sessions a day. To adventure into Great Bear Rainforest on foot start at Bella Coola, the gateway to the rainforest. Reached via Highway 20, the drive offers stunning views of mountain ranges. Join a guided hiking tour along rainforest trails through Bella Coola Valley; there are trails for all walking abilities. Saloompt Forest Trail follows the Bella Coola River and crosses the Saloompt River Bridge, great for watching salmon spawning. For a more challenging hike follow the steep Medby Rock Trail 2,000ft up to the look out point, you will be rewarded with beautiful views of the valley. For an exhilarating activity try a heli-hike and get dropped off high up in the most remote mountain peaks. Exploring from the water on a kayak tour is another fantastic way to immerse yourself within this remote environment and a good way to wildlife watch. Aboriginal natives known as First Nation Communities are scattered across the rainforest, they follow traditions handed down from generations all shaped by their respect for the nature around them. 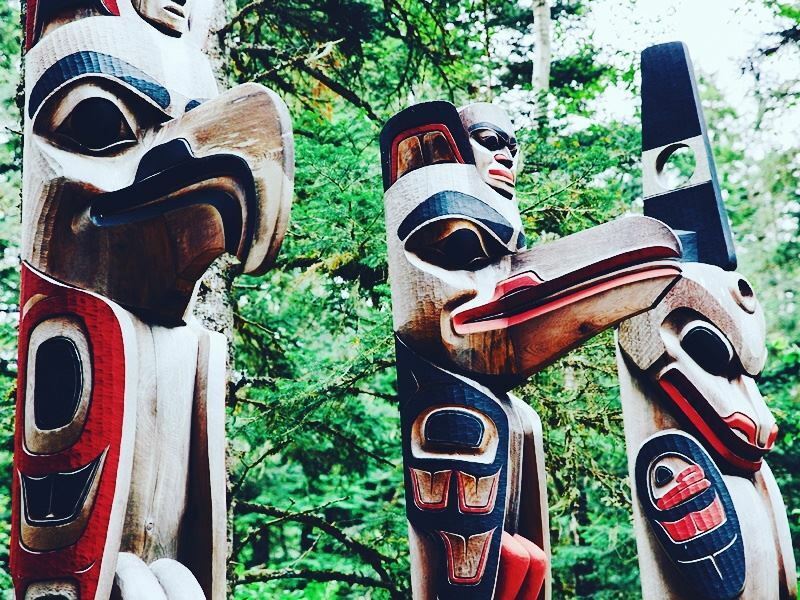 Be sure to look out for Totem Poles spotted across British Columbia these beautifully crafted creations are a spiritual representation of the First Nation’s beliefs. To really immerse yourself in this remote area stay in a cabin full of rustic charm, nestled in valleys, along river banks and in the mountains many come with all the mod-cons or some offer just the basics, choose what suits your holiday style. The Cariboo Chilcotin Coast is known for the Gold Rush Trail, gold was discovered in this area in the mid 1800's. 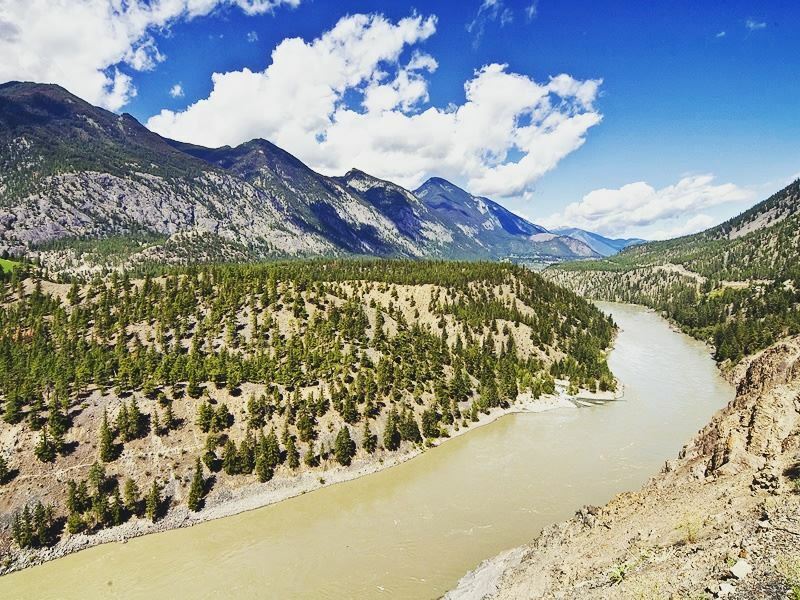 The Cariboo Wagon Road stretches from Lillooet to Barkerville, drive this magnificent route through canyons, along rushing rivers and up through steep mountain passes. Stop at historic towns dotted along Highway 97 such as 70 Mile House and 100 Mile House, these towns were once used as rest stops during the gold rush period. Visit Hat Creek Ranch and explore buildings that travellers would have used in the 1860s, jump on a wagon ride and roll along the original Cariboo Wagon Road. Another must do on the journey is to climb aboard Hell’s Gate Airtram. View the incredible rush of water of Fraser River from above, walk across the suspension bridge too and see why this section of the river is known as Hell’s Gate. Quesnel Forks is an interesting place to stop for a picnic; this once thriving gold mining camp is now a ghost town. Stroll around restored buildings and the historic cemetery to get a feel of this by gone era. To complete the journey learn how to pan for gold in Barkerville and take a small piece of history home with you. If in need of a rest from driving, canoeing is a great way to explore the waterways of this region from lakes and rivers, to creeks and the ocean there is a lot of paddling to be done. 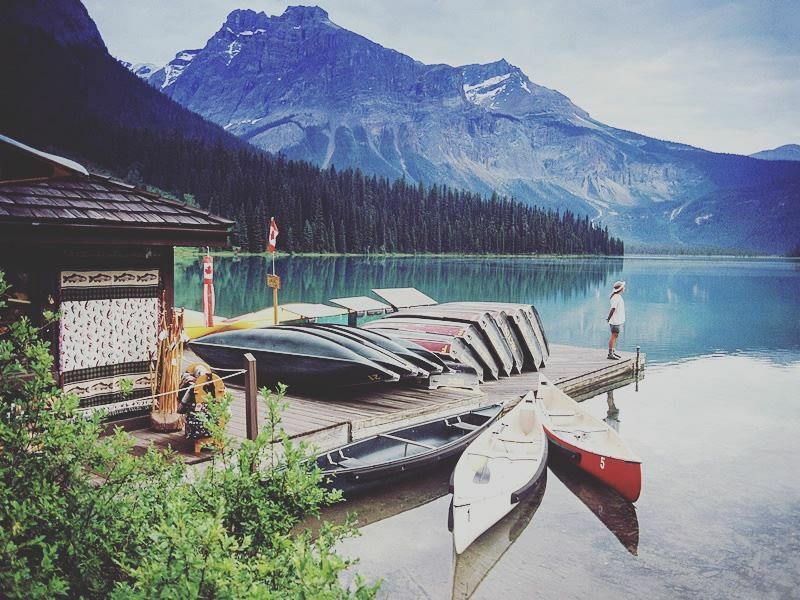 Bowron Lake Canoe Circuit makes for a scenic paddle with views of the Cariboo Mountains and Quesnel Highlands. A chain of ten lakes, waterways and passages make this 116km of beautiful scenery an epic adventure. Visit for a day or complete the whole circuit in six to ten days. The Moose Valley Canoe chain has campgrounds at either end of the route; watch out for wildlife along the banks of the twelve lakes as you go. If you are new to canoeing choose a guided canoe tour to paddle with an experienced local. A cabin is a rustic option for an overnight stay in the area, cabins range from timber B&Bs, guest ranches with log cabins and cosy cabins for two with gorgeous lake views. From alpine trails to vertical descents The Kootenays are a bike riders paradise, Rossland is unofficially known as the ‘Mountain Biking Capital of Canada’ and Revelstoke has a huge amount of cross country trails. The Golden Triangle is a popular mountain biking adventure, cycle through Yoho and Kootenay National Parks on this week-long trail. August welcomes the annual Nelson Fat Tire Festival, celebrating everything to do with bikes.Whitewater rafting is a must do while in the Kootenay Rockies, Kootenay River is an ideal location for all the family to take part in river activities, go on a full day rafting trip paddling for 30 miles through rapids and past waterfalls with the beautiful Rockies as the backdrop. For a thrilling adventure on the water drive to Kicking Horse River, paddle through challenging rapids and some crazy white water. There are plenty of companies to choose from and for many of the day trips no experience is necessary, it will definitely get your adrenaline pumping. Four out of seven of British Columbia’s national parks are found here, Kootenay, Yoho, Glacier and Mount Revelstoke. In Kootenay National Park go for a dip in Radium Hot Springs, the natural hot pools are a unique visitor attraction with water temperatures ranging from 35°C to 47°C. The nearby Olive Lake is a picturesque stop for a picnic. 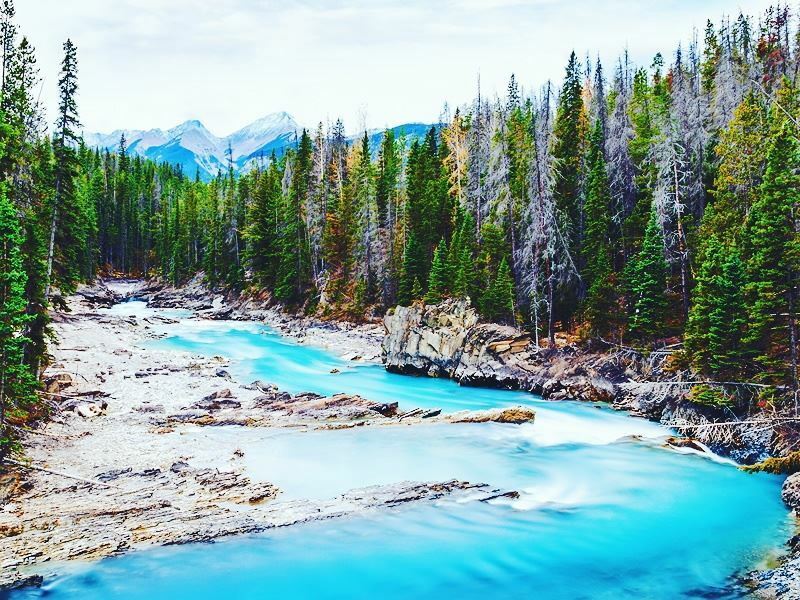 Hike to Marble Canyon and over a narrow gorge, passing waterfalls with soapy blue water. Follow the trail to the Paint Pots, these natural springs rich in minerals have turned the clay around them orange. Watch out for big horn sheep, elk, bears and deer on your drives and hikes here. Glacier National Park lives up to its name with 131 glaciers amongst its mountain ranges, visit Illecillewaet Glacier and marvel at the icy blue colours scaling down between the mountains. The drives are incredible through the park; mountain goats, bears, moose and caribou can all be spotted along the way. Discover the history of the park at Rogers Pass National Historic Site and follow the trail of the disused Canadian Pacific Railway line, which dates back to 1885. If you are looking for a real adventure park up your car for the night and explore on foot in Mount Revelstoke by heading into the wilderness for a spot of backcountry camping. There are no campsites accessible by road in Mount Revelstoke so hike with your tent and backpack to one of two very small sites. Eva Lake and Upper Jade Lake both have room for only four tents. Eva Lake is a two to three hour trek and Upper Jade Lake is a three to four hour hike, the remoteness of both offers a reward like no other, pass through dense alpine forest, across meadows and along lakes with nothing but the rustling of trees and rush of water for company. When in Yoho National Park, visit the thundering Takakkaw Falls, Canada’s second highest waterfall, water gushes from 302 metres high. Natural Bridge is an impressive rock formation on Kicking Horse River, which has been created by water erosion, several viewpoints allow for great photo opportunities. Join a guided hiking tour to the famous fossil site at Burgess Shale for an insight into these fascinating organisms that lived 508 million years ago. 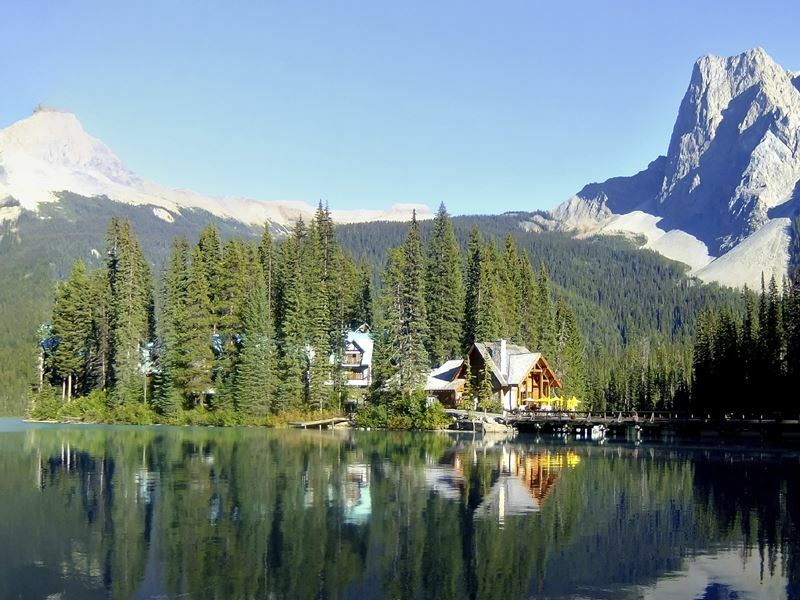 Stay at Emerald Lake Lodge, this luxurious timber chalet overlooks the stunning Emerald Lake and President Mountain Range. Cosy rooms have fireplaces stocked daily with firewood and the outdoor hot tub has picture perfect views of the lake. To experience all that British Columbia has to offer choose one of our fly-drive tours. Self-Drive Whales, Bears and Vancouver Island is an eight night tour incorporating a stay in Victoria and the opportunity to explore Pacific Rim National Park along with a stay in the wilderness at Sonora Resort and ending in Vancouver. British Columbia Cities and Wilderness is a five-night tour in Vancouver and Victoria, tailor this with an Alaskan cruise to really see it all. 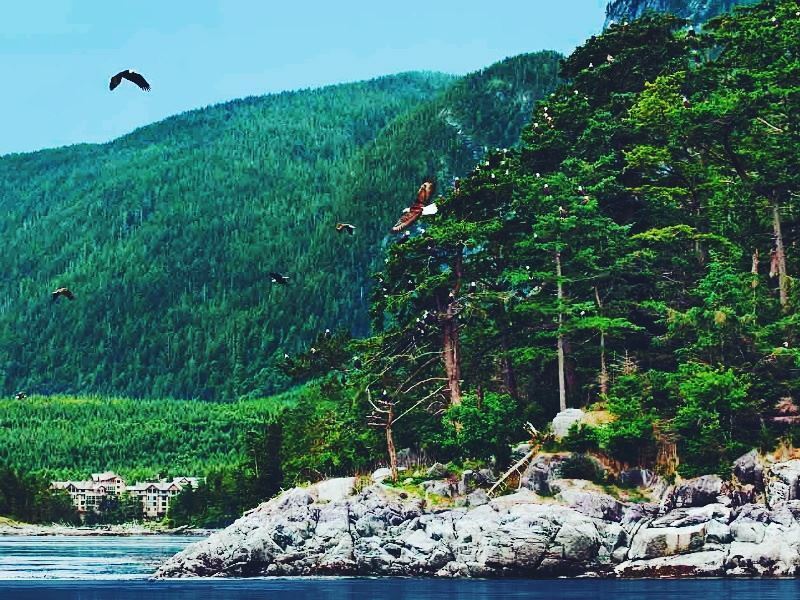 British Columbia is breathtaking from farmers markets and cityscapes in Vancouver to the wilderness of the Great Bear Rainforest, turquoise glaciers, sparkling lakes and snow capped mountains, there is adventure around every corner so get behind the wheel and explore this incredible place.